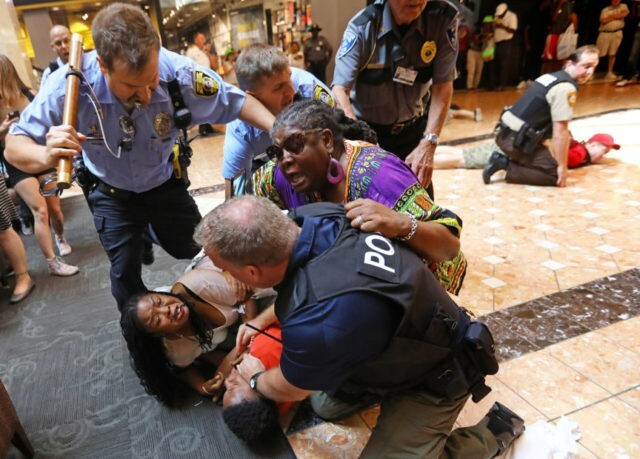 ST. LOUIS (AP) — Two St. Louis-area police agencies are defending their actions in arresting nearly two dozen protesters at a mall amid complaints that the demonstrators were taken down forcefully, including a female pastor allegedly put in a chokehold. A protest Saturday at the St. Louis Galleria in Richmond Heights, Missouri, was one of several since mid-September, when a judge acquitted former police officer Jason Stockley in the death of a black drug suspect. Media and social media photos of the arrests generated concerns, and a group of elected officials and faith leaders planned a news conference Monday to criticize what they’re calling “military tactics” used by police. Both St. Louis County and Richmond Heights police said their actions were justified. The protest began with about 150 people marching without incident through the upscale mall. Things took a turn when some protesters blocked an escalator and demonstrators sought to go the second floor, against the wishes of mall management. Someone threw a trash can at officers. Richmond Heights Capt. Gerry Rohr used a bullhorn to announce that the protest was no longer peaceful and the crowd must disperse. He said Monday he issued the same warning two additional times over several minutes as St. Louis County police arrived to assist. Rohr said most of the protesters left, but the 22 who remained were arrested. Seven were charged with rioting and resisting arrest, and some had to be subdued, Rohr said. One of them was the Rev. Karla Frye of St. Peter AME Church in St. Louis. A St. Louis Post-Dispatch photographer took pictures showing Frye on the back of a St. Louis County officer as he appears to be making an arrest. Another photo shows Frye being arrested. Protesters said the second photo showed her being choked by an officer. Rohr and St. Louis County police spokesman Shawn McGuire denied Frye was being choked. They said the photo showed a Richmond Heights officer pulling her away from the county officer she had jumped on, a man who is still off work with a back injury that resulted, McGuire said. Rohr said the photo was misleading. Frye faces assault and other charges. The 15 protesters not charged with state crimes have been referred to Richmond Heights Municipal Court for local citations, police said. Nearly 200 people have been arrested since protests began following the judge’s ruling on Sept. 15. Police tactics were also questioned on Sept. 17 in the city of St. Louis, when more than 120 people were arrested after windows were broken at several businesses. Some of those arrested for “failure to disperse” were just onlookers, including a Post-Dispatch journalist.